For other people named Ronald McDonald, see Ronald McDonald (disambiguation). Ronald McDonald is a clown character used as the primary mascot of the McDonald's fast-food restaurant chain. In television commercials, the clown inhabited a fantasy world called McDonaldland to which he had adventures with his friends Mayor McCheese, the Hamburglar, Grimace, Birdie the Early Bird and The Fry Kids. As of 2003, McDonaldland has been largely phased out, and Ronald is instead shown interacting with normal children in their everyday lives. Many people work full-time making appearances in the Ronald McDonald costume, visiting children in hospitals and attending regular events. At its height there may have been as many as 300 full-time clowns at McDonald's. There are also Ronald McDonald Houses where parents can stay overnight when visiting sick children in nearby chronic care facilities. The origin of Ronald McDonald involves Willard Scott (at the time, a local radio personality who also played Bozo the Clown on WRC-TV in Washington, D.C. from 1959 until 1962), who performed using the moniker "Ronald McDonald, the Hamburger-Happy Clown" in 1963 on three separate television spots. These were the first three television ads featuring the character. At the time, Bozo was the hottest children's show on the air. You could probably have sent Pluto the Dog or Dumbo the Elephant over and it would have been equally as successful. But I was there, and I was Bozo ... There was something about the combination of hamburgers and Bozo that was irresistible to kids ... That's why when Bozo went off the air a few years later, the local McDonald's people asked me to come up with a new character to take Bozo's place. So, I sat down and created Ronald McDonald. At the time, Scott was working for Oscar Goldstein, the Washington DC area McDonald's franchisee, and numerous sources describe Scott's role as only playing the part of Ronald McDonald, while giving credit for the creation of the mascot to Goldstein and his ad agency. "The smile known around the world," Ronald McDonald is second only to Santa Claus in terms of recognition. (According to one survey, 96% of all schoolchildren in the United States of America recognize Ronald (stunning-stuff.com)). In his first television appearance in 1963, the clown was portrayed by Willard Scott. On March 28, 2000, Henry Gonzalez, McDonald's Northeast Division President, thanked Scott for creating Ronald McDonald, during a taped tribute to Scott on the Today Show. Yet in 1965, Roy Burgold assigned Aye Jaye as Boss Clown worldwide in charge of hiring, writing, creating shows, media handling, training and major events such as The White House appearances, Macy Days, etc., and finally opening Ronald worldwide for 35 years. Aye Jaye was responsible for the hiring of hundreds of past field Ronalds. Circus performer Coco the Clown (real name Michael Polakovs) was hired in 1966 to revamp Ronald's image, to which he created the now familiar costume and make-up. In 2010, the Corporate Accountability International in Boston, Massachusetts suggested Ronald McDonald should retire due to childhood obesity. However, McDonald's CEO Jim Skinner said there are no plans to retire him. In April 2011, McDonald's announced that Ronald McDonald will reappear in their commercials. However, Ace Metrix says Ronald McDonald ads are no longer effective. On May 18, 2011, Corporate Accountability International renewed their call to retire Ronald McDonald by running ads in major newspapers and launching several web pages dedicated to the retirement of the character. However, McDonald's CEO Jim Skinner defended Ronald McDonald by saying that he is an ambassador for good and "it's all about choice". Shortly after McDonald's Website News Statements announced that Ronald McDonald is here to stay. In April 2014, McDonald's announced that Ronald McDonald will have a whole new look and new outfits. They also announced that he will be back in their new commercials as well as on social media sites like Twitter. 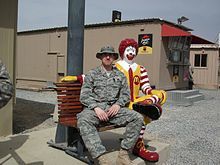 As part of Ronald's makeover, his jumpsuit has been dropped in favor of yellow cargo pants, a vest and a red-and-white striped rugby shirt. His classic clown shoes remain part of the official uniform. At any given time, there are dozens to hundreds of actors retained by McDonald's to appear as Ronald McDonald in restaurants and events. It is assumed, however, that the company uses only one actor at a time to play the character in national television commercials. Following is a list of primary American Ronald McDonald actors. Various forms of the name "Ronald McDonald" as well as costume clown face persona, etc. are registered trademarks of McDonald's. McDonald's trains performers to portray Ronald using identical mannerisms and costume, to contribute to the illusion that they are one character. McDonald's marketing designers and stylists changed elements of the Ronald McDonald character, persona, style, costume, and clown face when they adopted the clown as a trademark. In Thailand, Ronald McDonald greets people in the traditional Thai "wai" greeting gesture of both hands pressed together. The Thai version of the company mascot was created in 2002 by the local Thai franchise, McThai, as part of a "McThai in the Thai Spirit" campaign. The figure has also been exported to India and other countries where a similar gesture is used. In China, out of respect for Ronald McDonald as an adult, children refer to him as 麦当劳叔叔 (Uncle McDonald). In Japan, Ronald McDonald is called Donald McDonald due to a lack of a clear "r" sound in Japanese enunciation. Charlton Comics obtained the license to publish four issues of a Ronald comic sold on newsstands in 1970–1971. Over the years several giveaway comics have also been produced starring the character. 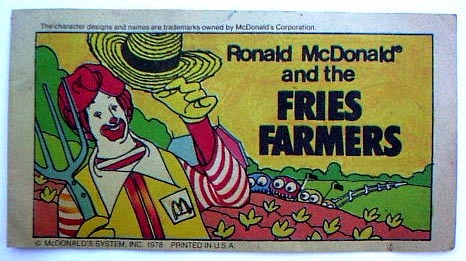 Ronald (with Grimace) appeared in the 1984 Little Golden Book Ronald McDonald and the Tale of the Talking Plant which was written by John Albano and illustrated by John Costanza. In 1991, Ronald appears in the Discover the Rainforest activity book series consisting of Paint It Wild: Paint & See Activity Book, Sticker Safari: Sticker and Activity Book, Wonders in the Wild: Activity Book, and Ronald McDonald and the Jewel of the Amazon Kingdom: Storybook, which are written by Mike Roberts and Russell Mittermeier, Gad Meiron, and Randall Stone, and illustrated by Donna Reynolds and Tim Racer, in which he is seen here as a nature show host and tour guide. In 1987, Ronald McDonald (with Birdie, Hamburglar, Grimace and the Professor) appeared in an eight-minute animated short film titled Ronald McDonald and the Adventure Machine, which was only shown in birthday parties at McDonald's restaurants. In 1990, a 40-minute animated direct-to-video film titled The Adventures of Ronald McDonald: McTreasure Island and produced by DIC Entertainment was released on VHS by Hi-Tops Video. From 1998 until 2003 a series of direct-to-video animated episodes titled The Wacky Adventures of Ronald McDonald and produced by Klasky Csupo were released in participating McDonald's worldwide on VHS. Ronald McDonald is the protagonist of two video games: McDonald's Treasure Land Adventure, developed by Treasure for the Mega Drive console and released in 1993, and Ronald McDonald in Magical World, developed by SIMS for the Game Gear handheld, released only in Japan in 1994. Ronald McDonald is also featured in two more video games: M.C. Kids for NES, Game Boy, C64, Amiga, Atari ST, and MS-DOS; and Global Gladiators for Genesis, Master System, Game Gear and Amiga. Ronald McDonald appears for a few seconds in the 1988 film Mac and Me during a birthday scene set at a McDonald's. He is played by Squire Fridell, but is credited as "Ronald McDonald as himself". He won a Golden Raspberry Award for Worst New Star for his appearance in the film. Because of his prominence, Ronald McDonald has become a symbol not just of McDonald's but of the fast food industry in the USA as a whole, as well as Corporate America, capitalism, globalization, and other broader topics. As such, the costume and iconography of Ronald McDonald is often appropriated by protestors and artists wishing to subvert the icon and communicate a message that runs counter to the corporate narrative. For example, in 2000, protestors in Hong Kong dressed as Ronald McDonald to protest McDonald's labor policy in China. Critics have claimed that a clown mascot targeting children for fast food is unethical. A group of 550 doctors took out newspaper ads in 2011 demanding Ronald McDonald's retirement. In 2010, the Corporate Accountability International in Boston, Massachusetts suggested that Ronald McDonald should be retired due to childhood obesity in the United States; however, then McDonald's CEO Jim Skinner said there were no plans to retire the character. On May 18, 2011, Corporate Accountability International renewed their call to retire Ronald McDonald, by running ads in major newspapers and launching several web pages dedicated to the retirement of the character. McDonald's CEO Jim Skinner defended Ronald McDonald by saying that he is an ambassador for good and "it's all about choice". Shortly afterwards, McDonald's Website News Statements announced that Ronald McDonald is here to stay. In 2014, McDonald's new CEO Don Thompson said that Ronald McDonald does not encourage kids to eat unhealthy foods. He stated Ronald McDonald only spreads joy and smiles. The Corporate Accountability International failed to retire him due to the fact that he is a national icon and has been around for half a century. ^ Bellomo, Mark (2016-10-04). "A Brief History of McDonaldland and the Toys (and Lawsuit) It Spawned". Mental Floss. ^ Heller, Karen (30 March 2018). "It's the worst time in history to be a clown. They just want you to love them again". The Washington Post. Retrieved 2 April 2018. ^ a b "Big Burger Business: McDonald's and Burger King". Heavyweights. Season 2. Episode 3. 2008-04-21. Food Network. Archived from the original on 2008-10-12. ^ "McDonald's sends in the clown, again". USA Today. December 10, 2001. Retrieved November 7, 2017. ^ Rexrode, Christina (2011-05-19). "Midlife crisis for Ronald McDonald?". The Sun News. Associated Press. Archived from the original on 2012-09-12. Retrieved 2011-05-19. ^ Williams, Alex (24 April 2014). "Ronald McDonald Officially A Hipster". WebProNews. Retrieved 26 April 2014. ^ "McDonald's plans a Ronald revival". The Baltimore Sun. Retrieved 31 July 2017. ^ Province, Ben (October 19, 2011). "MBU Runs for Ronald". Malibu Times. Archived from the original on January 15, 2013. Retrieved April 25, 2012. ^ Smith, Andrew F. (2016). Fast Food: The Good, the Bad and the Hungry. Reaktion Books Ltd. ISBN 9781780236094. ^ Goldwert, Lindsay (2011-05-19). "Is Ronald McDonald an evil influence? McDonalds hits back at clown critics". NY Daily News. Retrieved 2017-04-02. Wikimedia Commons has media related to Ronald McDonald. This page was last edited on 13 April 2019, at 19:33 (UTC).